Ketil Solvik-Olsen has long been one of the conservative government’s most popular ministers, but he’s suddenly meeting the proverbial train wreck. Not only does a train strike loom this week, major plans and funding for train and road improvements reportedly are about to derail. 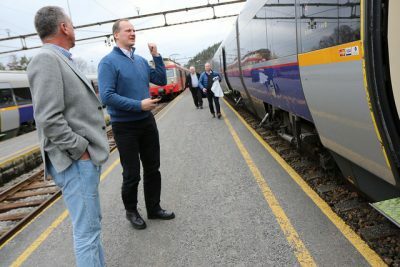 The affable Olsen has been on the defensive since newspaper Aftenposten reported last week that Bane Nor, the state agency in charge of railroad infrastructure in Norway, wants to postpone the long-anticipated InterCity train project. It’s part of the National Transport Plan and is supposed to bind together mid-size cities around Oslo with double-tracks and better service by 2024. On the same day, newspaper Dagens Næringsliv (DN) reported that neither Solvik-Olsen’s train line improvements nor some of his roadbuilding projects are on track. Expansion of the E39 highway west of Kristiansand is delayed, for example, and putting various train lines out to competitive bidding is delayed as well. Then came news that Bane Nor planned to charge commuters up to NOK 9,000 a year to park at outlying stations where parking has always been free, to encourage commuters to take the train instead of driving to work. That was quickly reversed after public outcry and complaints that Bane Nor “was living in its own world.” Aftenposten also reported that state railway NSB admits it has laid off too many workers in its own efficiency campaign, forcing a string of cancellations and delays and overcrowing the fewer train that were running. On Thursday news bureau NTB reported the scariest news for commuters and travelers. If mediation fails between Bane Nor and its employees, around 100 Bane Nor workers will walk off the job on Tuesday just in the first phase of a strike that’s likely to spread. Lines most affected will include those between Gjøvik and Oslo (Gjøvikbanen) and Kongsvinger and Oslo (Kongsvingerbanen) plus stations in Trøndelag. Service between Oslo, Trondheim and Hamar can also be affected. At issue are changes in working conditions posed by the reorganization of the former state railroad agency Jernbaneverket that’s now operating as Bane Nor. Employees are demanding to retain earlier agreed-upon contracts regarding work shifts, travel compensation, days off for senior employees, paid meal breaks and discounted tickets, for example. “The employees were promised that they wouldn’t lose on the establishment of Bane Nor,” Rolf Ringdal, leader of the labour organization Norsk Lokomotivmannsforbund (NLF), told NTB. “In practice that’s exactly what’s happening.” Despite 35 meetings with Bane Nor management before Christmas, no agreement has been reached, leading to this week’s strike warning. It’s all been enough to prompt headlines like “Murder on the Østlandet Express” in newspaper Dagsavisen, which editorialized over the weekend that Bane Nor was “sending a torpedo” towards rail improvements in all of Southeastern Norway. 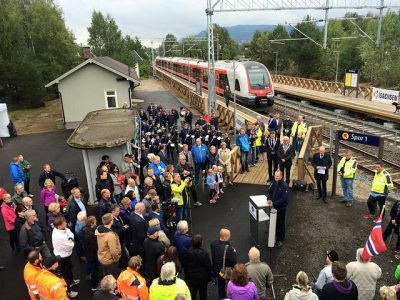 Solvik-Olsen is also a target, with implications that state bureaucrats are pulling the emergency brake on his zeal to speed up improvements and modernize transport in Norway. Solvik-Olsen initially ducked questions when Bane Nor’s plans were first revealed. Then he tried to fend off questions and claims on state broadcaster NRK’s popular morning political debate program Politisk kvarter that the delays would break campaign promises. He insisted repeatedly that improved service remained “the ambition.” He later responded to DN‘s claims about problems and delays on both rail and road projects by writing that both he and the new Bane Nor rail agency and Nye Veier roads agency are simply trying “to use taxpayers’ money with respect.” Extra time is being invested, he claims, to cut costs in the long run. Cost control and better planning, he contends, are worth some potential construction delays. Solvik-Olsen told Aftenposten on Saturday that he can only assume Bane Nor “manages to meet its goals” regarding both the InterCity project and others. He finally admitted he was also surprised by the potential delays and claims the time plan should nonetheless be retained. “We were warned just a few days before (Bane Nor released a progress report) that some changes would be proposed,” Solvik-Olsen told Aftenposten. “It would have been much better if Bane Nor had delivered what we approved. It would have been a major advantage if we had received this information (on what makes the current time plan “unrealistic”) last year.” He stressed, however, that Bane Nor had simply “dug deeper into evaluations of how contractors can deliver, how traffic will be disrupted during construction periods and whether there’s risk of “traffic chaos” if lines are worked on to open simultaneously. He said “we all must listen” to the new details, that according to Bane Nor’s new boss, can spare the public from excessive disruption during the construction phase. As he tried to calm down commuters and the opposition in Parliament this week, everyone hoped a strike would be averted as well. The deadline for mediation was set for midnight Monday.